Pears are one of the leading fruit sources of fiber. 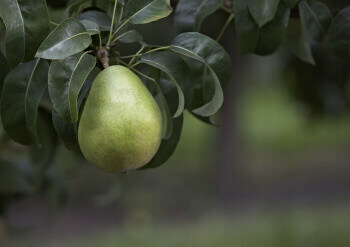 A medium-sized pear packs 6 grams of fiber, which equals about 24% of the recommended daily value. The skin contains the majority of the fiber found in a pear, so enjoy the skin for added flavor, texture, and nutrients. Fiber is a type of carbohydrate called a complex carbohydrate. Did you know that our bodies cannot digest fiber and it doesn’t contain any calories? The very fact that we can’t digest fiber is what makes it so important for our health. Fiber acts like a sponge as it travels through our digestive system, absorbing water and removing waste and toxins. According to the Dietary Reference Intakes* (DRIs), a reference for recommended and adequate intakes of particular nutrients, most American adults should consume between 21 and 38 grams of fiber per day, depending on age and gender. There are two basic types of fiber that compose dietary fiber. Soluble fiber absorbs water and softens stool; this type of fiber also helps reduce cholesterol. Insoluble fiber helps to bulk the stool for easier passage through the intestines. Diets low in saturated fat and cholesterol and rich in fruits, vegetables, and whole grains that contain fiber, particularly soluble fiber, may reduce the risk for heart disease, a disease associated with many factors. Low fat diets rich in fiber-containing grain products, fruits, and vegetables may also reduce the risk of some types of cancer, a disease associated with many factors. Check out this delicious Creamy Pear and Coconut Smoothie which not only provides fiber, but also vitamin C and calcium. Be sure to leave the skin on as that contains the majority of the fiber! * Dietary Reference Intakes as recommended by the National Academy of Sciences.